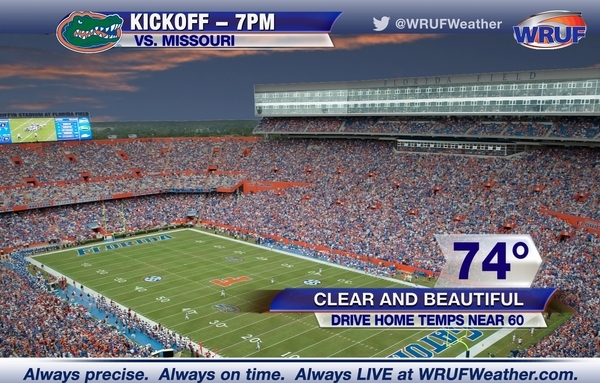 Afternoon temperatures will spend 3 days in the 70’s beginning Saturday in Gainesville. Forecast lows and lowest wind chills over the next four mornings. Hour by hour in Gainesville on Tuesday. 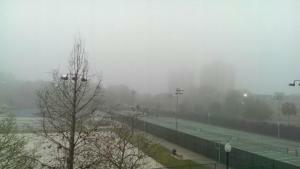 Notice the dramatic changes that take place between 8 am and 10 am. Thursday marks the end of our warming trend. 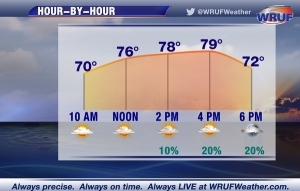 Temperatures reach the upper 60’s to lower 70’s across North Central Florida. With cooler air in place, temperatures will struggle Tuesday afternoon despite abundant sunshine; it’ll be breezy too. 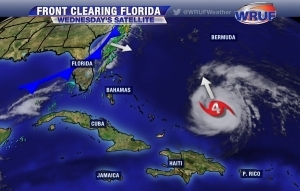 Animation of Futuretrack, showing the timing and location of the rain Wednesday and Wednesday Night in North Florida. Chill Tracker (showing what it will feel like) Tuesday morning at 7 am. 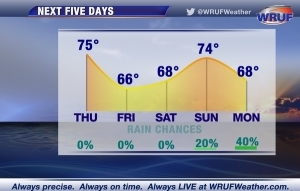 WRUF Weather is forecasting two more days of comfortable temperatures and sunny skies, before big changes arrive Friday. Mid 30’s are expected Tuesday morning for inland locations, with coastal zones staying in the 40’s. 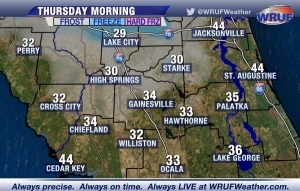 Patchy frost will be possible in outlying areas and along the Suwannee River Valley. Hour by hour showing gradually clearing skies Friday morning and cool temperatures Friday afternoon. Wednesday night will be our coolest night of the week despite cloud cover. These values are just a few degrees above January normals. Animation of Futuretrack, showing the increase in moisture Thursday with possible showers, followed by cooler/drier air on Friday. 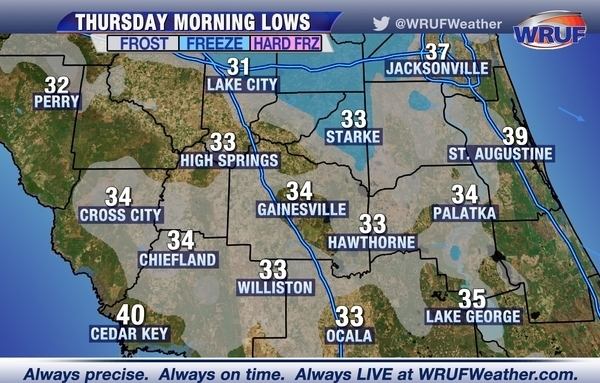 Lowest wind chills expected across North Florida Thursday morning (what it will feel like when you factor in the wind). 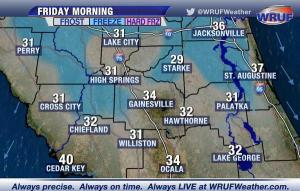 Forecast lows Thursday morning in North Florida from WRUF Weather. The purple shaded region is where a hard freeze is likely. The blue areas will experience temperatures below freezing. 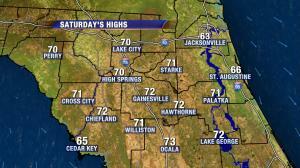 With warm southerly air, temperatures will easily reach the 70’s across north Florida on Saturday. Clouds will help prevent widespread frost from forming overnight tonight. Animation of Tuesday night’s clouds and how they moved in after midnight. 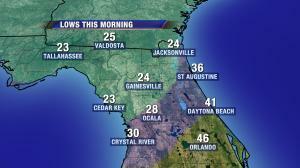 Wind chill factors reveal the feel’s like temperature for the morning commute.